Benchmark Accuris Taq DNA Polymerase provides superior results for routine applications. 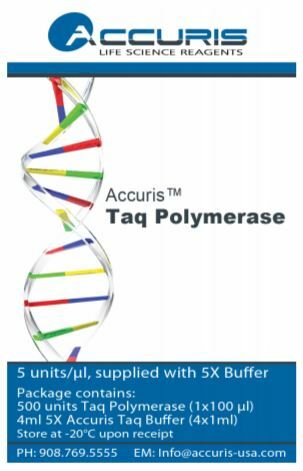 Modified to improve DNA-binding, Benchmark Accuris Taq DNA Polymerase offers higher solubility and template affinity, resulting in consistently superior performance during polymerase reactions. This Taq DNA Polymerase from the Benchmark Accuris range pre exhibits a 5′ to 3′ nuclease activity, but no 3′ to 5′ (proofreading) activity and works well with a wide range of DNA templates including GC-rich sequences. 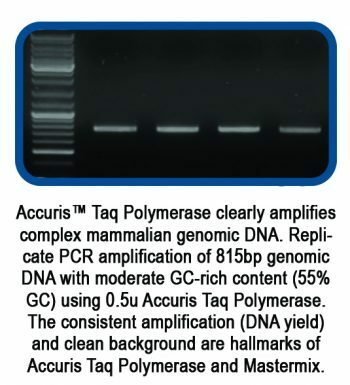 Benchmark Accuris Taq DNA Polymerase is supplied with a 5 X buffer containing MgCl2 and a proprietary mix of enhancers (dNTP’s not included). 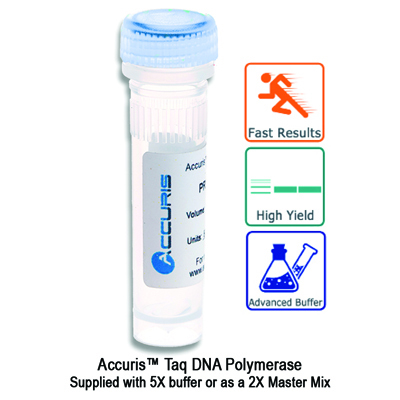 For convenience, Benchmark Accuris Taq DNA Polymerase is also available in a ready to use 2 X Master Mix – just add primers and template DNA and you are ready to go. The Master Mix can be ordered with a red loading dye that allows samples to be loaded directly on an agarose gel without any additional steps or additions, saving you time and streamlining your protocols. Highly soluble with an increased affinity for template DNA, Benchmark Accuris Taq DNA Polymerase is suitable for a variety of assay conditions and templates. Improved yield, activity, sensitivity and speed are achieved by modifying the polymerase with the addition of hydrophilic residues. The proprietary 5 X buffer system with PCR enhancers and optimal levels of MgCl2 has been created to partner with Benchmark Accuris Taq DNA Polymerase. 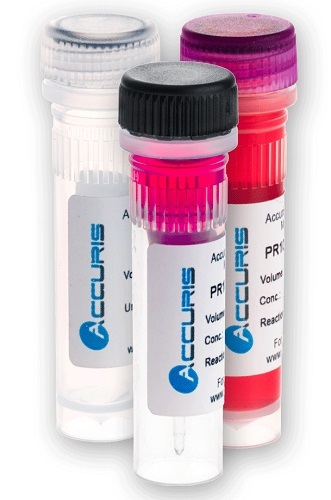 Accuris enzymes and reagents are tested under general assay conditions for activity, reproducibility, efficiency, heat activation, sensitivity, and absence of nuclease contamination and nuclease activity. This product is manufactured under a comprehensive quality management system, following ISO 9001:2008 standards.